Stradanus, Johannes (= Jan van der Straet, Brugge 1523 – Florence 1605). 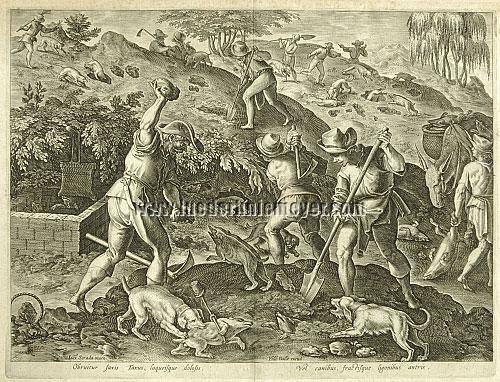 Obruitur saxis Taxus laqueisque dolosis … The Variety of Hunting the Badger, the multitude of hunters and hounds. Engraving with etching by or for Philip Galle (1537 Antwerp 1612). (1578.) Inscribed: Io(hann)es Strada. inuen. / Phls Galle excud. 8⅜ × 11⅛ in (21.4 × 28.3 cm). Nagler, Stradanus, XVII, 449; Wurzbach, Philip Galle, 27; Schwerdt II, 227; Catalogue Marchegg, 1978, 108 with ills. – Sheet 75 of the 2nd part of Venationes ferarum … of altogether 104 – later supposedly even more – sheets, worked after Stradanus by various engravers and published by Ph. Galle. The plates, however, had been used in other compilations, too. Thus here under the removal of the number. – Latin distich. – For the preparatory drawing in reverse see catalogue Jeanson 528 along with illustration. – With surrounding margin of 4-5 mm and mounted by old before previous binding on laid paper. The resulting centerfold almost perceptible in the white margin only.